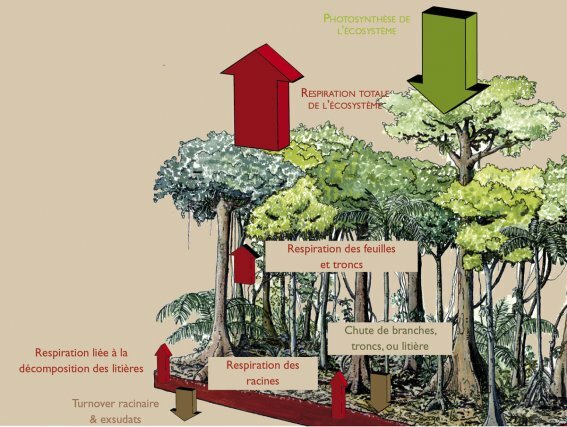 What is the current state of knowledge about the role the Forest of French Guiana plays in the carbon cycle? Planetary warming is a reality and scientific fact. Meteorological data from measuring stations show this, and French Guiana is no exception. Météo France has confirmed that the average temperature of French Guiana has increased by 0.6°C over the past half-century, and this rise has accelerated over the last two decades. Only a few years ago the causes of warming were still a matter of debate. But more recently, and especially after the publication of the latest IPCC report in 2007, only a few sceptics still deny the evidence. The increase in concentration of greenhouse gases in the atmosphere is behind this warming. Careful though, it is not the “greenhouse effect” itself which is to blame, but the ADDITIONAL greenhouse effect due to greenhouse gas emissions since the beginning of the industrial era. The greenhouse effect is a natural phenomenon on Earth thanks to which the average temperature at the surface of the planet is about 15.5°C. Without it the average would be close to minus 18°C, far too icy an environment for humankind. The phenomenon is simple. Solar radiation (at visible wavelengths) warms the Earth, which then gives off infrared radiation which is partly trapped by the greenhouse gases (H2O, CO2, CH4, etc.) present in the atmosphere, one of whose chemical properties is to absorb infrared radiation. That helps trap the energy from this radiation in our enormous “greenhouse”, that is the atmosphere, and so the more that is trapped the greater the level of warming. This phenomenon has been amplified by the increase in greenhouse gases over the past 150 years, and is continuing today at a rapid pace. The consequences for the environment, vital resources, food production, and health in particular are as yet poorly understood and not easy to determine. They could be positive, with the expansion of the geographical area of certain species (e.g. the holly oak wood be able to grow as far north as Paris), but mainly negative (with the rise in average sea level and disappearance of islands and fragile ecosystems and animal and plant species, the emergence of new diseases, and especially an increased level of droughts). 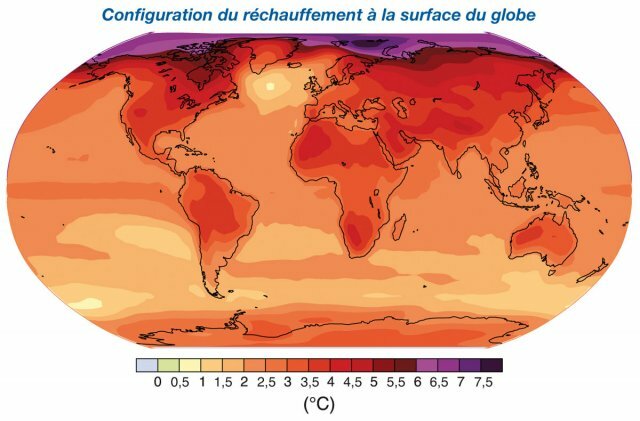 The IPCC is predicting an increase in the annual average air temperature of about 3.3.°C in French Guiana. Variation in rainfall is also forecast, with an increase of 4% during the rainy season and a drop of 3% during the dry season. The consequences of this forecast are many and varied. Longer, more severe droughts; a rising sea level; the disappearance of certain plant species; bigger floods; the easier transmission of vector-borne diseases such as dengue fever and malaria; a drop in agricultural yields; and especially, the reduced capacity of the forest to store CO2. In the face of the imminent and mainly disastrous consequences of climate change for mankind and ecosystems, in the early 1990s it became clear just how urgent it was to reach an international agreement. At the 1992 Earth Summit in Rio de Janeiro 150 countries signed the United Nations Framework Convention on Climate Change. They undertook to “stabilise greenhouse gas concentrations in the atmosphere at a level which will avoid dangerous human interference with the climate system”. This is where the idea of making use of the ability of the forest to sequestrate CO2 first took root. But it was not until February 2005 when Russia ratified the Kyoto protocol – devised in 1997 – that the fight took a new turn. Fighting climate change shifted from the world of geopolitics to that of economics. 55 industrialised countries accounting for at least 55% of CO2 emissions agreed to an overall reduction of 5.2% of their emissions of the six main greenhouse gases between 2008 and 2012 in comparison to 1990 levels. In order to achieve this they came up with accounting rules for greenhouse gas emissions as well as a flexible system. Each industrialised country has a quota of maximum emissions that it has to get its businesses to respect. But as pollution caused by greenhouse gas emissions affects large areas and concerns the planet as a whole this quota, fixed on a yearly basis by comparison to the national inventory of greenhouse gas emissions, may be traded between States, between a State and a business, or between businesses. If emissions are below the threshold the State may cede some of its quota to another country. If on the other hand it exceeds the authorised threshold the State has to balance its annual carbon accounts using various means (buying quotas from other States, including carbon sequestrated by the country’s forests, or buying carbon credits from United Nations accredited projects to combat climate change). Via these projects, primarily in developing countries, every tonne of CO₂ not emitted into the atmosphere (e.g. by using electricity generators that used less diesel) or that had been sequestrated (e.g. by planting trees) gives rise to a carbon credit that may be added to the emissions quota. What role does the forest have in all this? The Kyoto protocol recognises the important role forests play in fighting climate change, via the dual processes of sequestration and substitution (replacing fossil fuels or materials with wood from sustainably managed forests). In addition to the ability to capture carbon in the atmosphere, if sustainably managed (as is the case in French Guiana) a forest also provides atmospherically neutral wood products, unlike concrete, iron, or petrol, the production or combustion of which emit large quantities of greenhouse gases. Nevertheless, under the Kyoto protocol in its present state, only forests planted in developing countries on land which has not been wooded since 1 January 1990 may produce valid carbon credits (cf. the rules of the Clean Development Mechanisms, or CDM). These are the much talked about organic carbon sinks. For the moment the new “green gold of French Guiana” will not be carbon. It has to be said that as things stand it is not the organic carbon sinks that will make the country’s and project operators’ fortunes. Out of the 47 projects that have so far requested accreditation only five have officially been granted it – in China, India, Moldavia, Vietnam, and Tanzania – covering only a few thousand hectares. But the scientific community and political leaders – particularly in French Guiana – are working to get the arrangements of the current protocol altered to include the role certain managed natural forests play as carbon sinks. Whilst the CDM approach is strewn with obstacles, no initiative to combat climate change and establish organic carbon sinks should be overlooked – especially not voluntary ones. It might not be THE solution but it still has a role to play. Since 1997 the French National Forestry Office (or ONF) has been working on this challenge via its subsidiary ONF International. It carried out its first experiment in Brazil in the State of Mato Grosso for Peugeot, in the heart of the arc of Amazonian deforestation. Twelve years on nearly 2000 hectares have been planted, capturing around 20,000 tonnes of CO2 per year, or the equivalent of the average annual greenhouse gas emissions of 3200 people in mainland France, or 11,000 Brazilians. ONF International is now taking part in the setting up of several dozen organic carbon sinks in countries around the world (including Chile, Colombia, Argentina, Brazil, Cameroon, the Democratic Republic of the Congo, Madagascar, Indonesia, and Cambodia) either as part of the CDM or as voluntary initiatives. Since late 2007 the new challenge for forests within the Kyoto protocol has lain elsewhere, and new rules will be fixed this year. Nearly 20% of annual greenhouse gas emissions are due to the cutting and burning of wood and changes to the soil brought about by forest land being used for urbanisation and especially for agriculture, phenomena which are nothing new. Nearly 13,000,000 hectares of forest go up in smoke every year. Amongst the leading countries here are Indonesia and the Amazonian regions of Brazil. Understanding the way the Amazonian forest (and the forest of French Guiana) works, and the processes behind greenhouse gas exchanges is thus of great importance. Accurately assessing the amount of carbon stored in the forest and properly understanding the mechanisms influencing this provides the requisite scientific basis to combat climate change and inform international negotiations. 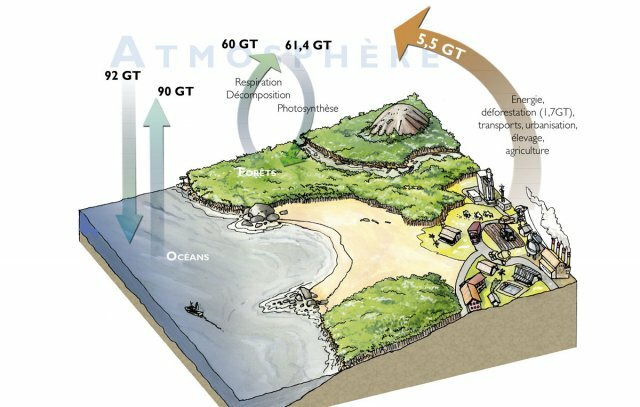 It is currently estimated that the plant biomass of the forest in French Guiana represents 1.5 gigatons of carbon (Guitet et al., 2005), or about half of all the carbon that builds up each year in our planet’s atmosphere. This is an additional reason to take good care of this forest, and exploit it in a sustainable manner by supporting the use of wood from French Guiana in the construction industry, as well as by planning the management of this vast and developing territory, for the threats to it are real (uncontrolled installations, mining without replanting). The role played by the forest in storing carbon – source or sink? 2) the forests are not as mature as we think and so are still in a phase of regeneration after past perturbations (during the period running from 10,000 to 2000 BC) which might have left profound traces on the way they function. But careful, if humid tropical forests store CO2, felling a larger quantity of trees than they are able to regenerate (clearing them completely for agriculture or gold mining) results in a significant reduction in the amount of CO2 stored and so they become sources of greenhouse gases. When you’re talking about the net effect of a region, Amazonia for example, it is therefore important to specify exactly which zone you are talking about. Untouched Amazonian forests are a very significant CO2 sink, but overall when you include both the untouched forests and those which have been destroyed and burnt, the Amazonian forest is a major source of CO2 in the atmosphere. This is not the case with temperate forests in Europe where the surface area has regularly increased over many decades. Furthermore, the majority of these forests store carbon and the harvesting of their wood maintains these forests in a state of sustained growth. What can the forests of French Guiana teach us? In French Guiana researchers with CIRAD (French Centre for Agricultural Research for Developing Countries) and INRA (French National Institute for Agronomic Research) have set up experiments to assess the amount of carbon stored in the forests of French Guiana and the net CO2 effect of exchanges between the forest and the atmosphere. 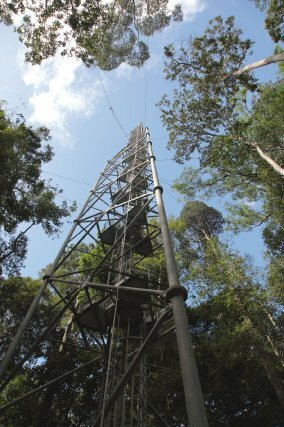 High-tech sensors have been placed at the top of the Guyaflux tower in Paracou near Sinnamary so as to obtain measurements of respiration and photosynthesis. 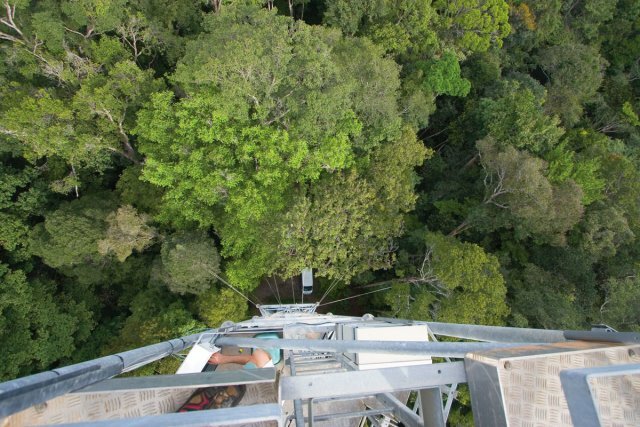 This 55-metre tall tower stands about twenty metres above the treetops, making it possible to assess the CO2 exchanged by the forest every half hour over a surface area of up to about 100 hectares. 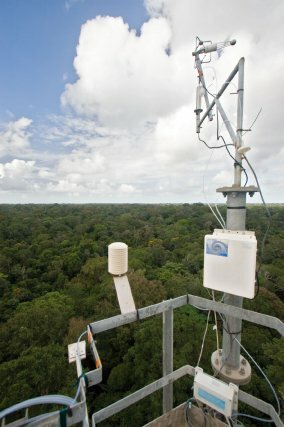 This sort of device using “turbulent correlation” measurements is present in 250 other sites around the world, but only two other ones are in humid tropical forests, both in Brazil. It makes it possible to understand the exchanges of CO2 between the atmosphere and the ecosystems, as well as the influence the climate has on the way ecosystems operate. The data collected by these instruments are integrated into networks (Fluxnet) so as to compare the way they function, to model them, and ultimately to make forecasts about the influence of climate change. Data acquired over the past five years at the Paracou site by D. Bonal and his colleagues from INRA show that the forest of Paracou absorbs more CO2 then it emits each year, thus confirming that it acts as a carbon sink. However this yearly assessment hides major variations in flows and in net daily effects from one season to the other. During the height of the rainy season (May and June) the low level of sunlight results in low levels of photosynthesis, but there are high levels of respiration. During this period the forest is thus a source of CO2 for the atmosphere. When the dry season starts levels of respiration are still high but so are those of photosynthesis during the fine sunny days. So the net effect is in favour of photosynthesis and the forest acts as a carbon sink. When the dry season is particularly pronounced (as was the case in 2003, 2005, and 2008) respiration, in particular at ground level, tends to drop off sharply due to the lack of water in the earth. Photosynthesis also drops but to a lesser degree. The overall effect is thus that the forest acts as an even more significant CO2 sink. When the rains return in December and January, respiration levels are high once again and on rainy days the forest is a major source of CO2 for the atmosphere. If the forest as a whole acts as a CO2 sink, it is important to understand where the absorbed carbon is actually stored. 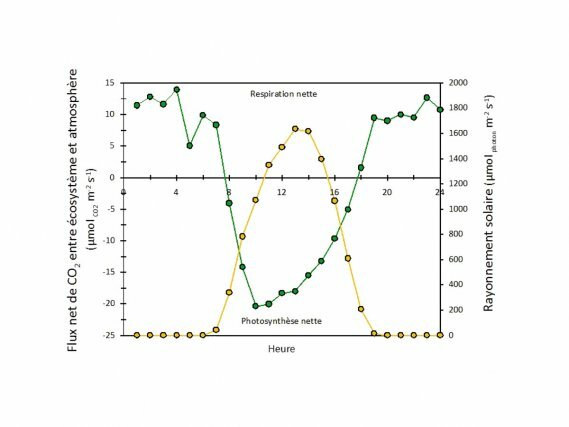 The aim of the work carried out by L. Blanc and his colleagues at CIRAD is to characterise the net carbon effect in the compartment made up of the trunk and leaves. Foresters and researchers have regularly been measuring the size of trees (the circumference and height) since the late 1970s in permanent forest study zones. 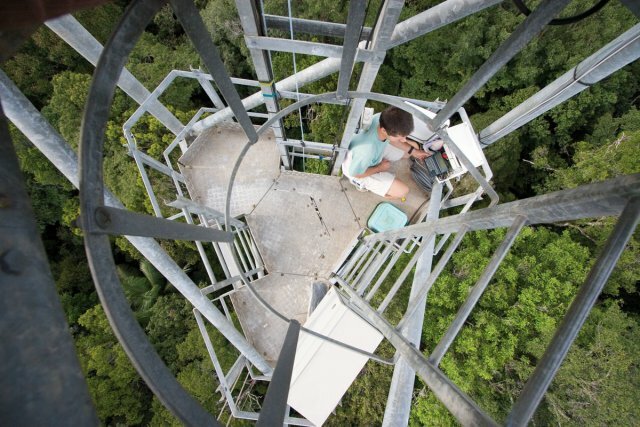 These observatories of the long-term changes occurring to forests are spread along the coastal strip of French Guiana. Measurements from them together with data about the density of the wood are then integrated into mathematical models which provide the tree’s biomass (its weight). A tree with a diameter of 70 centimetres can weigh up to 8 tonnes, including about 4 tonnes of carbon. Monitoring the demographic behaviour of each tree (its apparition, growth, and death) in a well-defined area provides information about changes in the amount of carbon stored by the trees of the forest. A forest with more or bigger trees will take carbon in. But a forest that is losing its trees gives carbon out. 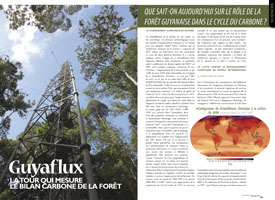 The trees measured since 1984 on 6 permanent zones near the Guyaflux tower at the Paracou study zone tell us that the forest is “getting bigger”, thus confirming the results from the tower. Every year the forest accumulates on average 380kg of carbon per hectare. But this figure varies from one place to another, and some forests have even lost carbon. Furthermore, the observation is only valid for the few decades in which the forests have been monitored. A severe drought (like the one that affected the Amazonian basin in 2005) could bring about high levels of tree mortality and cause the amount of carbon stored by the forests to drop, and it would take many decades to reconstitute the amount lost in just a few months. It is therefore unwise to extrapolate to a larger scale from these results and conclude that the forest in French Guiana is indeed a carbon sink. The setting up of a network of forest zones (the GUYAFOR network) will deliver a carbon assessment in a few years for fifteen sites in French Guiana. This will be a first step towards confirming (or invalidating) the results from Paracou. 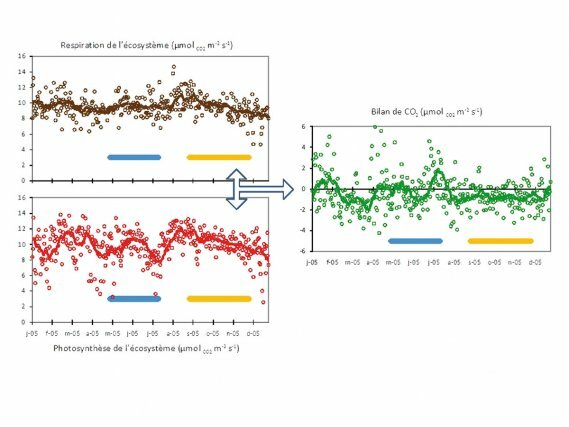 French Guiana is a major intertropical zone research site for estimating the amounts of carbon stored in humid tropical forests and their net carbon effect thanks to its long-established measurement systems and use of some of the most advanced technologies. But an awful lot remains to be done. What impact will climate change have on the carbon cycle in forests and their role as a carbon sink? Theoretically an increase in the level of carbon in the atmosphere will have a positive impact on tree growth, but will this be offset by the longer dry seasons leading to greater mortality? Is it possible to generalise results for an enormous territory (there are 550 million hectares of forest in Amazonia) given the extremely diverse ways these forests are used and managed? What may be deduced from the detailed observation of how forests function over a timeframe of several decades when most of the trees are many centuries old? A real challenge for the generations to come!